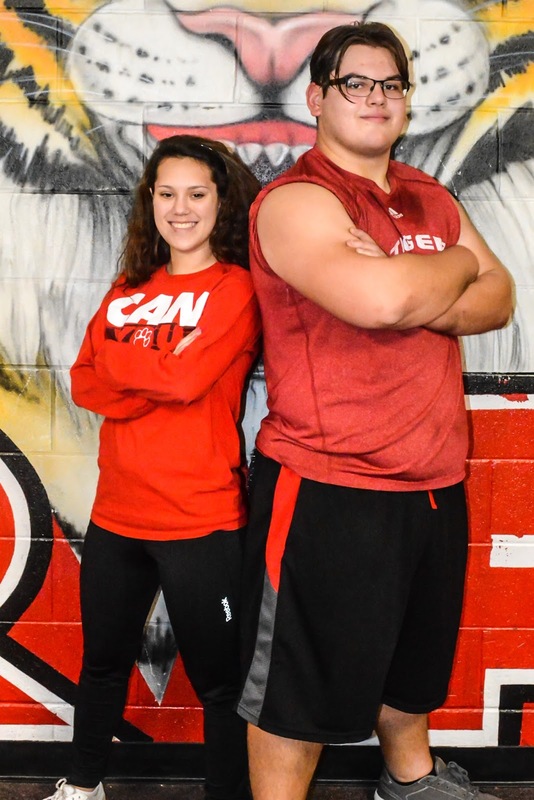 This Saturday Eric Roberts and Annie Tidwell will lead a team of Tiger powerlifters to their first meet of the year in Sunnyvale. Eric and Annie are Seniors who represented Terrell at the Texas State Powerlifting Championships last year. Eric is a super heavyweight who lifted a combined 1480 lbs at the State meet in Abilene last March. He finished 12th in the 5A/6A combined class, and from 5A schools he was 4th. This year he has set goals of 700 squat, over 400 for the bench press and 600 for the deadlift. If he hits those numbers he could be looking at top 5 in the State. Annie qualified for regional at 97lbs and 105lbs. She competed in the 105 wt class. She went to State lifted a combined 415 lbs in the Girls meet in Corpus Christi. Annie finished 14th in the state. Her goal is to increase her totals in all 3 lifts and return to state. Eric was also named 2nd Team All District offensive line for the district champion and regional finalist football Tigers. Annie is a varsity cheerleader.